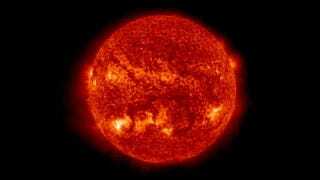 For as long as we've bothered to care about heavenly bodies other than our own, we've thought that the size of the Sun varies throughout its 11-year solar cycles. Intense magnetic forces, the theory went, rendered it as malleable as a sturdy stress ball. That was a good theory, backed up by decades of data. What Jeffrey Kuhn and his team at the University of Hawaii in Pukalani have discovered, in fact, is that the Sun's shape doesn't vary at all. It's rounder than we thought, sure, and flatter—if you can reconcile those two in your brain—but it's also terrifically consistent. Ours is one resilient orb. The more we know about the Sun, the more we know about how it affects the Earth. The most fun part of all of this, though, might be how we finally figured out our mistake. The researchers called on data from NASA's Solar Dynamics Observatory, which has the distinct advantage of being in space. Turns out our stupid earthbound measurements have been distorted by our stupid atmosphere this whole time.